A VERY FINE & RARE REGIMENTALLY MARKED AMERICAN REVOLUTIONARY WAR USED SECOND MODEL/SHORTLAND PATTERN 1777 BROWN BESS MUSKET, ca. 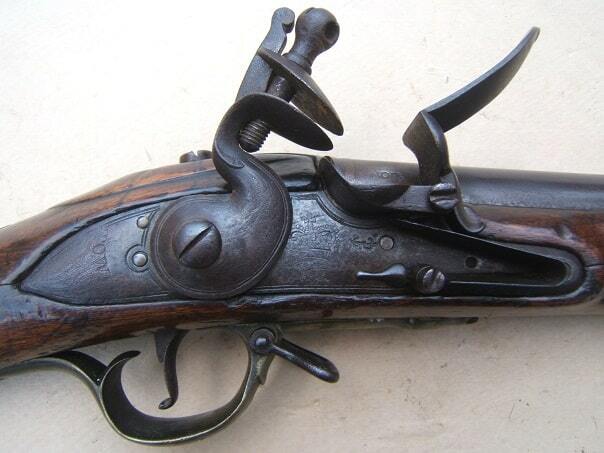 1778: In overall very fine original flintlock condition. The regulation pattern, round, pin-fastened, 42″, sighted/top-mounted bayonet-lug, .78 caliber, browned (75%+), iron, smoothbore barrel with two (2) clear Board of Ordnance/Govt. 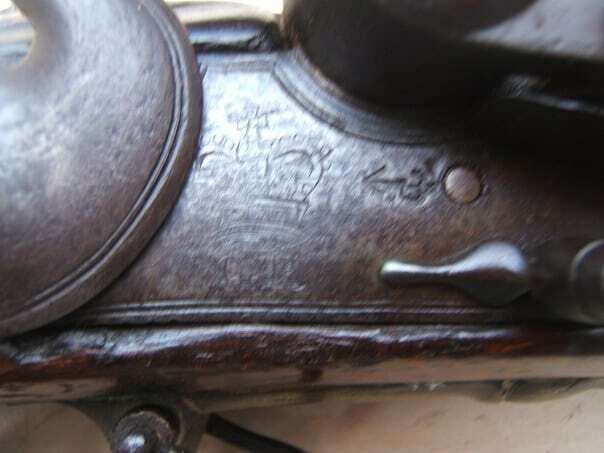 Tower proof marks, a Crown/6 Acceptance mark, at the touch-hole and an additional Board of Ordnance Crown acceptance Crown marking, on the barrel-tang. A partially effaced “M. RL F?SI?” Regimental Marking, on the top of the breech. (The Regt. Marking possibly that of the “Royal Fusileers”/7th Regt.). 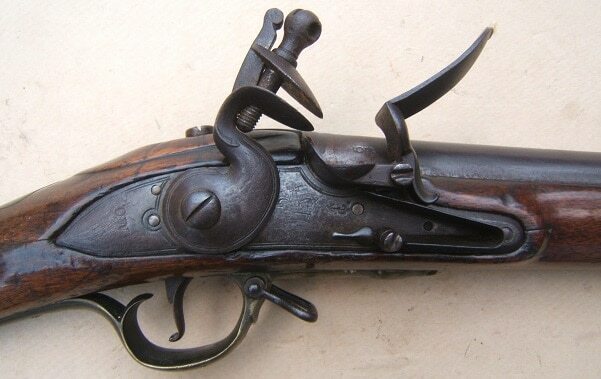 Regulation Pattern 1777 lockplate with thread-engraved borders and two (2) screw-tips, behind the rounded gooseneck hammer with fine Wartime Notch. Teardrop finial frizzen spring and its original bridled powder-pan and rounded frizzen. The tail nicely marked with a “TOWER” marking and the face of the lock with a clear “Crown GR” and Govt. ownership/Broad Arrow marking, beneath the powder-pan. Fine Crown with clear details and some expected light wear. In very fine condition with choice steel surfaces, sharp engraving, much finish and very fine mechanics with a crisp action and a strong mainspring. Only some isolated patches of light wear and signs of use with a smooth gunmetal age-patina. The barrel, en suite with smooth surfaces, much finish, clear markings and fine bore. Regulation Shortland Pattern, molded and carved, walnut fullstock with a raised carved beavertail apron at the barrel tang, a pronounced raised lobe on the handrail and the right face of the deeply fluted buttstock, with a correctly un-dated, Revolutionary War Issue Storekeeper’s mark. Additionally marked behind the trigger-guard with two (2) Board of Ordnance Acceptance marks and with several inspector’s marks, in the ramrod-channel. Fine+ stock with nicely molded and contoured surfaces. Retains 85%+ finish with some scattered light handling marks/tight hairlines, minor gouges, clear Board of Ordnance markings, abrasions and signs of use. Regulation Pattern 1777, brass hardware/mounts: the buttplate with a pin-fastened, 3-stepped tang. The trigger-guard with a raised hazelnut finial and its rear with a “32” Rack number. A flat S-shaped sideplate with a tail, two (2) sidebolts, a pin-fastened nose-cap; and an “A/12” Company/Unit marked wrist escutcheon. Four (4) baluster type ramrod pipes (for iron rammer): the second pipe of “Pratt’s Improvement” design, ca. 1778. 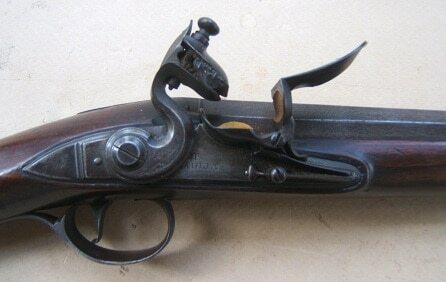 In overall very fine original flintlock condition. The lock surfaces retain an evenly toned, smooth, steel-gray patina with some light patches of discoloration. Very fine barrel with much of its brown finish, smooth surfaces, sharp Ordnance markings and a fine touch-hole. In mechanically functional order with a strong mainspring. Fine+ stock with 85%+ finish, sharp contours and clear markings. The expected handling marks and old tight hairlines along the forestock. Complete with both of its sling-swivels and its button-head iron ramrod. Nicely toned brass furniture with a smooth patina. 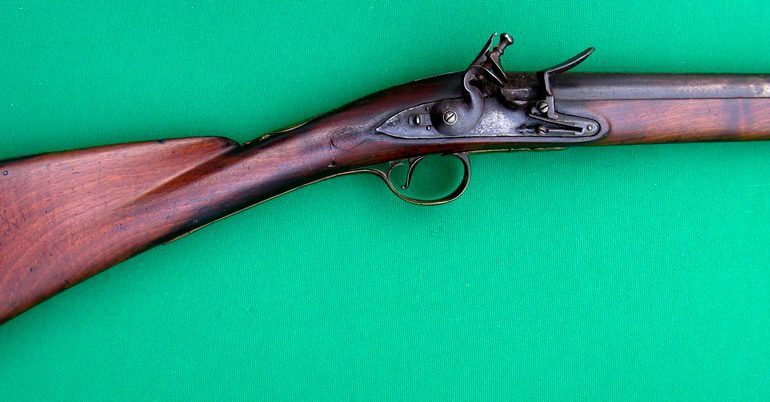 A very fine example of an American Revolutionary War used P. 1777 Shortland Pattern/Second Model Brown Bess Musket with possible Regimental Markings to the 7th/Royal Fusiliers Regt., who entered Canada, in July of 1773 where involved in the Battle of Monmouth, New Jersey June 28, 1778, the Connecticut Raids of July, 1779, the Battle of Cowpens & Charleston during the Southern Campaign of 1780-1781 and left from the British Isles, in 1783. (Please see A. Darling’s: “Redcoat and Brown Bess”, pg. 56-63. Overall length, 58″. For additional information and similar examples, please see G. Neumann’s: “Battle weapons…” & D. Bailey’s: “Pattern Dates for British Ordnance Small Arms…”.